Saving a Report in BI Sage 200 - 3 Key Things to Remember! Saving a Report in BI Sage 200 – 3 Key Things to Remember! So, you have spent hours tinkering around with your BI Report. You have perfected the layout, the formatting looks great and you’ve saved it – sorted. However, next time you come to open your report, you get an error message. If this is the case, there was probably an error when you saved the document. Saving a report can be tricky, but that is why I am writing this blog! Here are my 3 key things to remember when saving a report within Sage 200 BI. When you save a BI Report, it is important that you use the BI Save function rather than the Excel Save function. The Save icon highlighted in green is the Save Function of BI. When saving a report, if you use this feature it will save as a BI Report. If you use the Excel Save icon highlighted in red, you will be saving as a standard Excel document and will lose all BI Functionality within your report. Having selected the BI Save option, you will then be faced with the Save window which automatically takes you to the Local file locations. Within this folder, you will need to save the file within the Report folder. This means that the report is available to you from your machine, but not to all other users. When you save the Report, it is extremely important to save the file as a ‘.xls’. Depending on the version on Excel you are using, it may automatically save it as a ‘.xlsx’ if so, you will need to change the file extension to ‘xls’. If the file saves as a ‘.xlsx’ it will corrupt the report, when you try to reopen the report it will just appear blank. Therefore, every time you save the report you must double check the file extension is a ‘.xls’. So, there you have it. My 3 top tips for saving a BI Report successfully. Follow these, and you should be able to happily save and edit BI Reports until your heart is content! Once you have successfully saved your reports, you will need to make sure you open them in the right way. You can of course browse to the file location and open from there, however, I think the easiest way is to open it via Excel. Open Excel > Sage BI Tab > select the Open Report Function. As with the BI Save Function, it is always better to use the BI Function than the standard Excel File > Open Function. After clicking the Open Report icon from within the BI Tab, it will automatically take you to the Local file location that the reports are saved in. From within the Reports folder you can then open the report. From there, you can edit or view the report, just make sure you save it correctly again! 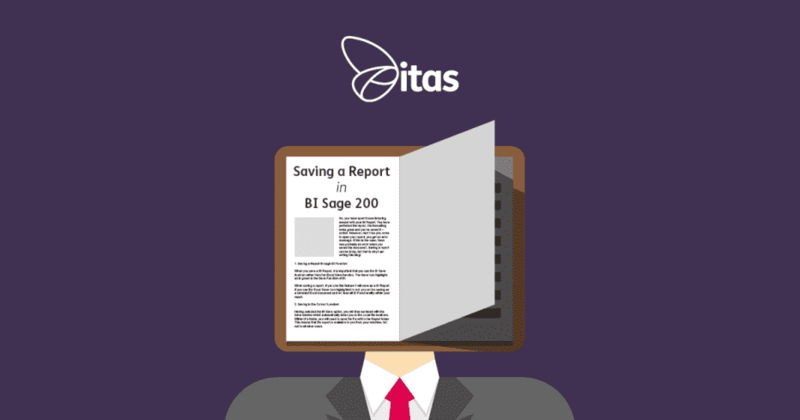 What did you think of this Saving a Report in BI Sage 200 blog? Here at itas, we absolutely love feedback… both good and bad. If you found this blog helpful, let us know and if not please do inform us so we can improve our content for you! For other tips on Sage 200 BI, check out our other blogs. Alternatively, if you have any questions you can send us an email to info@itas.org.uk. Home » Sage Blog » All Sage Blog Posts » Saving a Report in BI Sage 200 – 3 Key Things to Remember!